sVirt is a technology included in Red Hat Enterprise Linux 6 that integrates SELinux and virtualization. sVirt applies Mandatory Access Control (MAC) to improve security when using guest virtual machines. This integrated technology improves security and hardens the system against bugs in the hypervisor. It is particularly helpful in preventing attacks on the host physical machine or on another guest virtual machine. This chapter describes how sVirt integrates with virtualization technologies in Red Hat Enterprise Linux 6. User Space - memory area where all user mode applications and some drivers execute. Web App (web application server) - delivers web content that can be accessed through the a browser. Host Kernel - is strictly reserved for running the host physical machine's privileged kernel, kernel extensions, and most device drivers. DNS Server - stores DNS records allowing users to access web pages using logical names instead of IP addresses. When services are not virtualized, machines are physically separated. Any exploit is usually contained to the affected machine, with the obvious exception of network attacks. When services are grouped together in a virtualized environment, extra vulnerabilities emerge in the system. If there is a security flaw in the hypervisor that can be exploited by a guest virtual machine, this guest virtual machine may be able to not only attack the host physical machine, but also other guest virtual machines running on that host physical machine. These attacks can extend beyond the guest virtual machine and could expose other guest virtual machines to an attack as well. 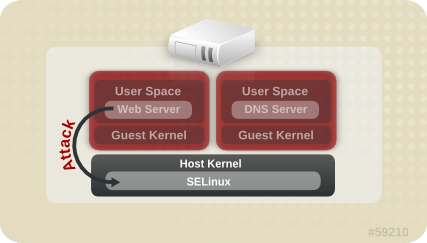 SELinux introduces a pluggable security framework for virtualized instances in its implementation of Mandatory Access Control (MAC). 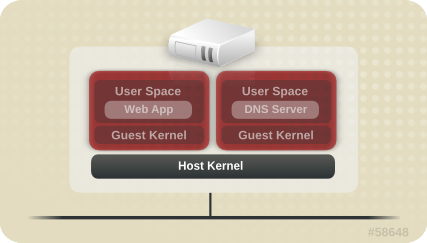 The sVirt framework allows guest virtual machines and their resources to be uniquely labeled. Once labeled, rules can be applied which can reject access between different guest virtual machines.